Practice your English conversation with a certified English teacher online in a relaxed, informal environment. ​A new topic every class! ​Ask Questions, Get Answers, and Practice Your English in our Slack Chat Room. 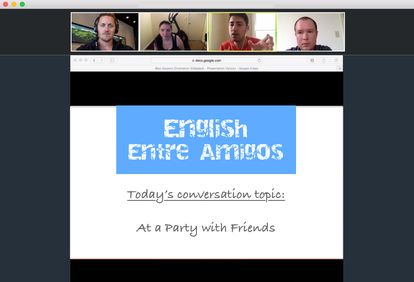 This is an awesome opportunity to meet other English Entre Amigos students and hang out with everybody online! Do You Have Questions? Every Wednesday I answer your questions directly in our private Facebook group. I will also teach an English lesson and discuss interesting, cool, and fun topics! ​Only $50 USD per Month.